Crews are tearing down smokestacks at Ball State University (BSU) in Muncie, after sitting unused since 2014, the Star Press reports. The smokestacks’ deconstruction sets the last stage of a $83 million geothermal project. Gerald Chimney Co., St. Louis, is tearing down the two smokestacks. Crews cut a hole into the base of each stack, knocking brick inward from the top of the stack down, the report says. Piles of debris are removed by another crew at they build up toward the bases of the stacks. As of Aug. 8, the west stack was more than halfway demolished and the east stack was around a quarter demolished. According to the report, work on the stacks should be completed by Aug. 26. 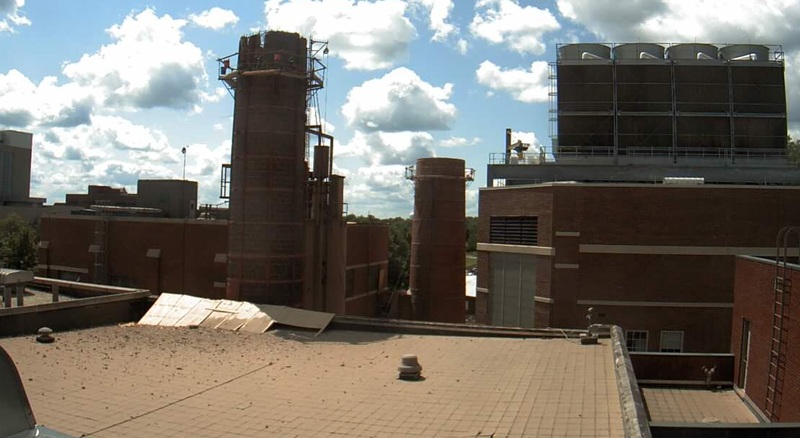 The university switched over to a geothermal heating and cooling system in 2014. The project, which started in 2009, replaced the school’s coal heating and cooling system. According to the report, the plant previously burned 36,000 tons of coal per year. Now, the report says, the plant runs off natural gas to produce steam and the smokestacks are no longer necessary. A live stream of the demolition is available here.